Located 250 metres from Barcelona's Arc de Triomf and Plaza Urquinaona, Black Swan Hostel offers a free snack, free WiFi and air-conditioned rooms. It has a 24-hour reception and a public area with flat-screen TV. Fitted with wooden flooring and large floor-to-ceiling windows, rooms boast a rustic décor with modern furniture. 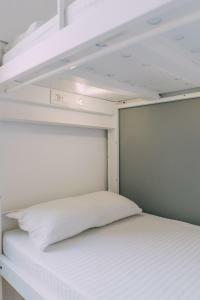 The soundproofed rooms include private lockers with universal plugs, as well as bed linen. Towels are available at an extra cost. 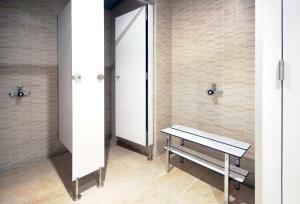 All rooms have access to a shared bathroom with showers. The property boasts a fully-equipped kitchen with fridge, microwave, oven and hobs. There are also vending machines selling snacks and drink inside the property. The hostel organizes a range of activities for guests, such as Paella classes and walking tours. You will find a wide range of restaurants, bars and supermarkets in the surrounding area. Staff can provide information about what to see and do in the city. Public parking is available nearby. 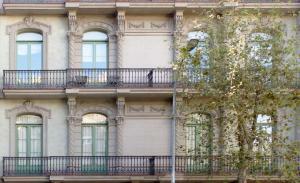 Plaza Catalunya, Ramblas, as well as the Borne and Gothic district, are 10 minutes’ walk away. The closest metro stations are Urquinaona and Arc de Triomf, just 2 minutes’ walk. Regular buses connecting to Girona Airport and to Costa Brava Coast leave from a bus stop located just 600 metres away. The property is fully adapted for disabled people and wheelchair users. To book a disabled bed, please contact Black Swan Hostel in advance. Please note bed linen is included in the rate and towels are available at an extra cost. When booking more than 4 beds, different policies and additional supplements may apply. A damage deposit of € 50 is required on arrival. You should be reimbursed on check-out. Fitted with wooden flooring, this 8-bed dormitory has large windows facing the city. There are private lockers with universal plugs. Rooms come with a shared bathroom with showers. Please note bed linen is included in the rate and towels are available at an extra cost. Rate: € 12.83 ... € 30.29; select dates below to get current rates. Fitted with wooden flooring, this 6-bed dormitory has large windows facing the city. There are private lockers with universal plugs. Rooms come with a shared bathroom with showers. Please note bed linen is included in the rate and towels are available at an extra cost. Fitted with wooden flooring, this 10-bed dormitory has large windows facing the city. There are private lockers with universal plugs. Rooms come with a shared bathroom with showers. Please note bed linen is included in the rate and towels are available at an extra cost. Fitted with wooden flooring, this 14-bed dormitory has large windows facing the city. 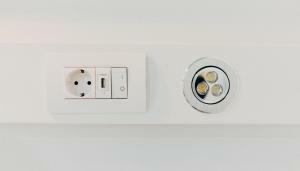 There are private lockers with universal plugs. Rooms come with a shared bathroom with showers. Please note bed linen is included in the rate and towels are available at an extra cost. Rate: € 14.79 ... € 30.91; select dates below to get current rates.